If you regularly colour or heat style your hair, it’s time to get excited because the hairdressing world’s holy grail treatment, Olaplex, has released a new shampoo and conditioner that are now available at DooWop Hair. If you’ve never heard of Olaplex, then your world is about to be rocked – if you are familiar with Olaplex, you know what a big deal this is. Here’s why you should be excited about Olaplex’s new No. 4 Bond Maintenance Shampoo and No. 5 Bond Maintenance Conditioner. Designed with its trademark Bond Multiplier Chemistry, Olaplex treatments are designed to repair broken bonds within the hair follicle in order to get your hair back to being strong and healthy. This process isn’t your run-of-the-mill conditioning or protein treatment; since it repairs the hair from within, it reverses the damage done by straightening, colouring, lightening, perming and even brushing. It’s no surprise Olaplex has become the go-to product for colourists and hairstylists. Since we all love a beauty routine, Olaplex has designed its products to be used in a three-step process. The No. 1 Bond Multiplier is a concentrate added to processes such as permanent and semi-permanent colour, highlights, perming and permanent straightening. The No. 2 Bond Perfector contains the same primary ingredient as No. 1, but without the lightener or colour working against it. Lastly, No. 3 Hair Perfector is a take home treatment you should use weekly to both further strengthen your hair and prime it for future styling and colouring. So what’s the big deal with Olaplex’s new shampoo and conditioner? 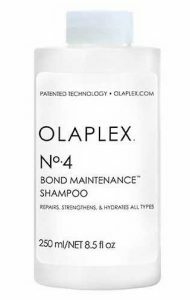 Olaplex’s new products are the fourth and fifth step in its existing beauty routine. The No. 4 Bond Maintenance Shampoo will penetrate your hair to hydrate, nourish and improve its integrity. Next, the No. 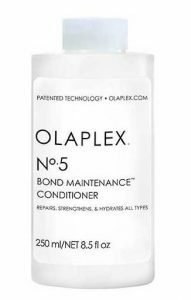 5 Bond Maintenance Conditioner will restore and repair your hair without weighing it down. Used together, these new products will banish damage and frizz from your hair and leave you with enviably strong, healthy and shiny hair. The benefits of using Olaplex products don’t end here. Their products are never tested on animals, and you won’t find any nasties such as silicones, sulphates, phthalates, DEA, aldehydes or gluten in Olaplex. On top of this, all of Olaplex’s packaging is made from recycled plastic collected from the ocean, meaning you don’t have to sacrifice your environmental concerns for your dream hair. To see what the fuss is about, head to DooWop Hair to check out Olaplex’s No. 4 Bond Maintenance Shampoo and No. 5 Bond Maintenance Conditioner, retailing at $49.95 each. Our Fremantle hair stylists are experts in the latest hair treatments and colour trends, meaning they can help you with everything from ensuring your hair is as healthy as possible to helping you find your signature style. Visit the DooWop website to find out more about our hair services or book your consultation today.